I am a runner. Yoga bores me to tears, I can’t be bothered doing traditional gym classes, and I really only do strength and core work when my coach forces me to. I owned a bike when I was in school, and even rode it a few times back and forth to uni when it was cheaper than paying for parking. Since I moved to London, though, I really only cycled on holiday, because, well, cycling in London traffic feels like a death sentence and I don’t need that kind of stress. My husband, however, is a cyclist. He detests running, so our only shared exercise tends to be those aforementioned holiday cycle rides. But he recently went and bought his third bike, and said I could use his old one (a 20+ year old, but very well loved Trek mountain bike). So we went out on a few rides around London to get me a bit more comfortable with light traffic and how the gears work (I highly recommend Southwark’s Healthy Rides if you’re new to cycling), and signed up to ride our first sportive together – a new experience for both of us as he’d never ridden in anything organised, either. 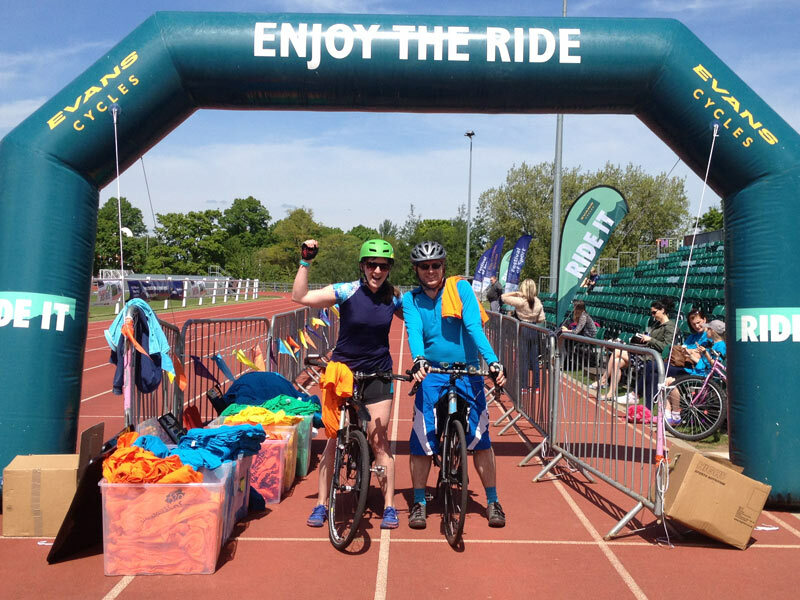 So with the Medway Ride It looming in our calendar, we squeezed in a few rides here and there around my marathon training, but with James’s commuting miles and years of experience, he was always going to be the more prepared of the two of us! 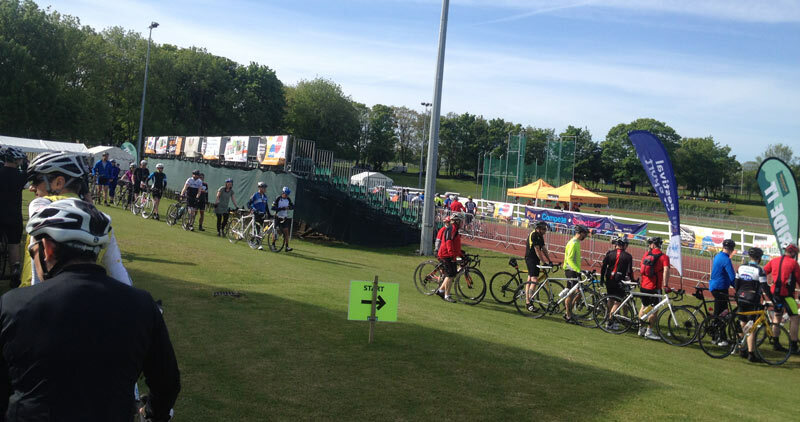 This particular sportive was available three lengths – 31mi, 50mi, or 85 mi, or as a shorter, 13mi course on closed roads later that evening as part of the Medway Big Ride festival. We went with the 31 mile, expecting it to be fairly flat considering it’s in the Medway and only rated a 2 out of 5. I finally got to wear my cycling Surf to Summit Top pattern out in an event! But before I get into the ride itself, I’d like to start by listing all the differences between this cycling sportive and running races. 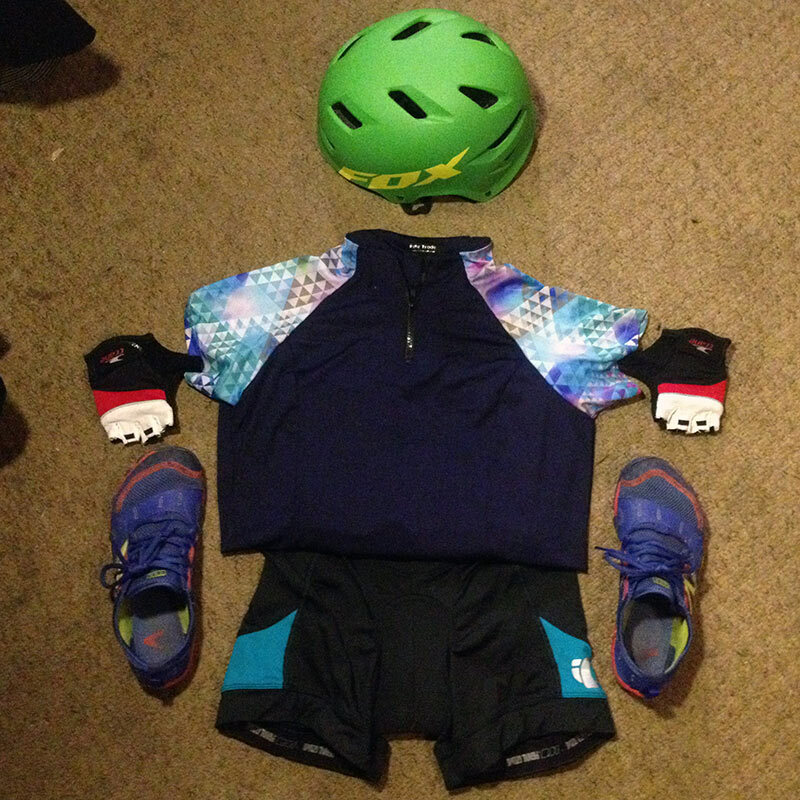 I’ve run probably somewhere between 50-80 races in the last 13 years, and I (probably naively) expected a cycling sportive to be a pretty similar experience, albeit with more gear. It was not. There’s no real start time. Instead of a massive scrum and a starting gun, with everyone pushing over the start line at once, this was really civilised. The starting time was any time within a 2hr period, and a genteel queue snaked back from the start. We got a safety debriefing, and then rode through the start gates one at a time to activate our timing chip. Very low stress! Prepare to ride mostly alone. Because the start is spread out over a few hours and three different routes, once we got past the first few miles we were on our own. An hour could go by before we saw any other riders. If you cycle a sportive on your own, you have a lot of time to think. Even at the places in the beginning where a bunch of us were queuing together at the stop lights, no one spoke. It was kinda weird when you’re used to chatting to other runners in running races. As a woman, you will be a curiosity (at best). Running races are getting closer to 50/50 these days, but even with this entry-level sportive, I’d say there were only 10% women or thereabouts. And cheers to the douchebag rider who shouted “oh great, now even the women are overtaking us!” as I sailed past. Don’t expect any spectators, or even any way for most people to tell you’re part of an event. If you’re looking for kids to high five or spectators to cheer you on, you need to be doing Ride London or the Tour de France or something. Nobody had any idea that we weren’t just out for a Sunday ride. There are very few (if any) marshals if something goes wrong. At this sportive, we were all given a sheet with a phone number to call if we got into trouble. Other than the feed stations, there were zero marshals along the way. There are very few water/fuel stations Our short route only had one, just after halfway. But then again, you can carry a lot more on a bike than you can when you’re running. A medal is not guaranteed. I expected one. d’oh. We just got a teeshirt at the end. Photographers are not lining the course eager to sell you mementos of yourself looking pained. In fact, I don’t think there was a single photographer at all. Compare this to even a little, local running race, where you’d have photographers at at least 3-4 points along the route. They seem to be missing a marketing opportunity. You may very well have to compete with cars, who have no idea you’re “racing”. This sportive was not on closed roads, so regular traffic was out and about. We had to stop at traffic lights, obey regular highway code rules, and put up with the same drivers you’d have anywhere. No distance markers, so a personal GPS is a must. Unless you’re keeping track yourself, you’ll have zero idea how far you’ve come (or how far away the finish is). Though in this sportive, we were sent the GPX files ahead of time, so you could at least doublecheck against your GPS that you were on the right track. The timing chip gets slapped on your helmet instead of your shoelaces. It’s nice that it was unobtrusive, but this was the only indication we were part of an event, and it was only the size of my pinky finger. No number on our bikes, jerseys, or anything, just a tiny sticker with a bar code. It’s nice in running races to wear a number so people at least know you’re part of an event. Sportives are not races. This was made clear by the big “This is not a race” signs on display at the start, and the results at the end give you no indication of ranking or anything. Just your chip time. Though we only chose the Short Route, at 31 miles this was still the farthest I’ve ever cycled (proper cyclists are forgiven for thinking “Awwwww!” right now), and this was just long enough for me. It was enough of a challenge – in terms of distance, climbs, and time in the saddle. By the end (ok, about 10 miles from the end!) I really was ready for it to be done, despite enjoying the overall experience! As evidenced by the mammoth list above, I learned a lot from this sportive. I learned how to use all my gears, for starters, and after the 4th or 5th hill, how to actually use them properly instead of just brute-forcing my way up the hills and trashing my quads. Considering you don’t really get hills (or descents) in London, it’s not surprisingly that I’ve never had to learn this before, only needing about 4 of my bike’s 15 gears in my previous rides [Correction: James has informed me that the bike actually has 24 gears!]. I also learned that, like in running, I’m much better on the climbs than the descents. There was a particularly steep descent on this ride, which was terrifying (especially with a car on my tail! ), plus sharp, blind switchbacks, and gravel on each turn. I hung onto the brake for dear life and prayed the car would just pass me already, though it never did (you can see all my speed & elevation details on Strava). I did not enjoy this massive descent whatsoever, though the others were better. Halfway through (ie: about 90min in for us) there was a feed station with water, High 5 electrolyte (to fill up your own bottles, no cups provided), and a ton of crisps, brownies, flapjacks and coconut macaroons to munch on. We had already filled our pockets with Shot Bloks and gels (James now understands my obsession with the Gu salted caramel gels! ), but it’d be rude not to, right? The worst part of the ride for me came just after halfway when we were directed off the road and onto a cycle path running alongside. This should’ve been preferable, except that the cycle path surface was so chewed up and bumpy that it was just hell to ride on. It may as well have been cobbles, to be honest! Despite being fitted for a cycle seat that minimises the saddle un-comfort, I still find cycling for anything more than an hour or two really not very pleasant to the bum. And (whisper it) I’m not quite coordinated enough to stand and pedal at the same time, so I can only lift my bum off if I’m coasting. On top of the rotton surface, there were also nettles overgrowing into the path, and James got stung on his legs as we rode through. To top it off, then some sort of insect flew up and stung me on the lip, which really threw me off my game for quite a while until the stinging eventually subsided. James definitely could’ve gone faster, but he kept waiting for me to catch up, which was very good of him – I would’ve been entirely on my own for 90% of the ride if it wasn’t for him! But it was nice to ride together where we could actually get up some speed and momentum and not have to worry about maps and directions. I kinda feel like the navigation is ultimately what you’re paying for in a sportive – the ability to just turn up and go for a nice ride without worrying whether you’re going the wrong direction or about to head onto a motorway or something. The path for this particular sportive was really well marked, with pink arrows at all the turns and pointing straight ahead in between. The organisers had also thought about the route and chosen quiet roads where possible and some truly beautiful little avenues of trees and vibrant yellow fields of rapeseed. 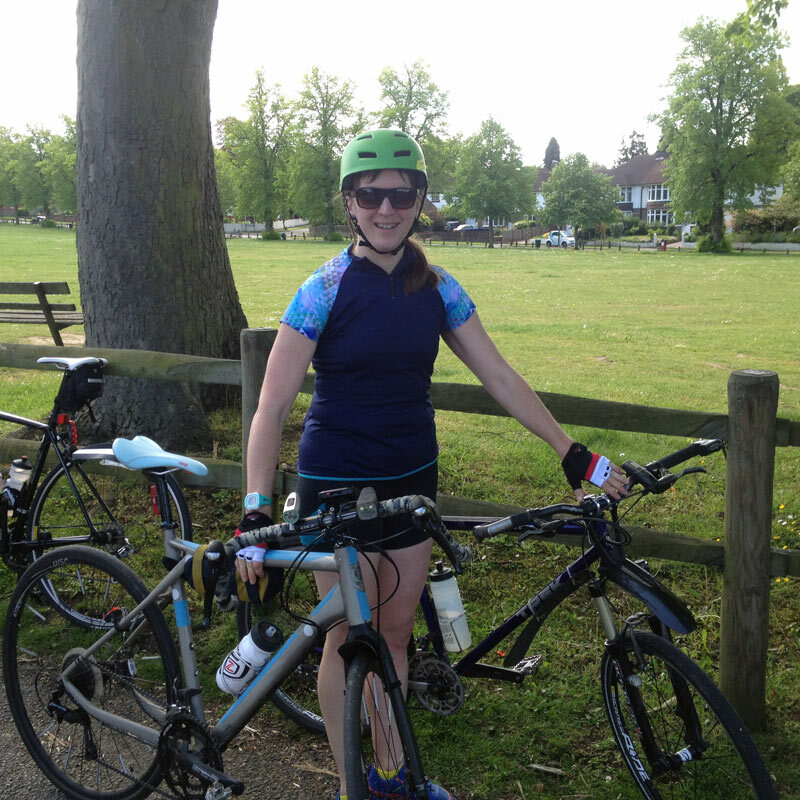 For someone who’d only really cycled in London, not having to stop/start every ten seconds and enjoying beautiful countryside views was a real treat. James clearly didn’t enjoy it though – after a recovery shake, even-more-recovery-roast-dinner and a shower, he had already signed himself up for another in July, and both of us for one in September, too (thankfully of a similar distance). I’ve got my fingers crossed for beautiful weather again already!